This month's #SWDchallenge was a straightforward one: create a basic bar chart. We sometimes avoid bar charts because they seem common or boring. Our view is that's the wrong approach. We should use them and use them frequently because they are common. The beauty of a bar chart is that our audience already knows how to read them and they can instead focus on what the data actually says. So we challenged you to teach us something new with a basic bar chart with bonus points for thoughtful use of color and annotations to call action to the main takeaway. 85 of you delivered, with bar charts ranging from single series vertical & horizontal to stacked to diverging. In keeping with the theme, we visualized your chosen topics to see what's trending on #SWDchallenge readers' minds. A couple notes to those who submitted examples: THANK YOU for taking the time and sharing your work. The makeovers are posted below in alphabetical order by first name (+ last initial when needed; we omitted full last names in respect of those who would rather remain anonymous). If you tweeted or thought you submitted one but but don't see it here, email your submission (including your graph attached as .png) to swdchallenge@storytellingwithdata.com and we'll work to include any late entries this week. Without further ado, here is a recap of March 2018's #SWDchallenge submissions. As you scroll though these, notice how easy it is to actually see the data! We can't overemphasize the beauty of the basic bar chart. Conventional financing represented two-thirds of the Northern Virginia real estate transactions in February 2018. Home buyers using government-backed financing will have challenges competing against individuals using conventional loans in the upcoming spring selling season. 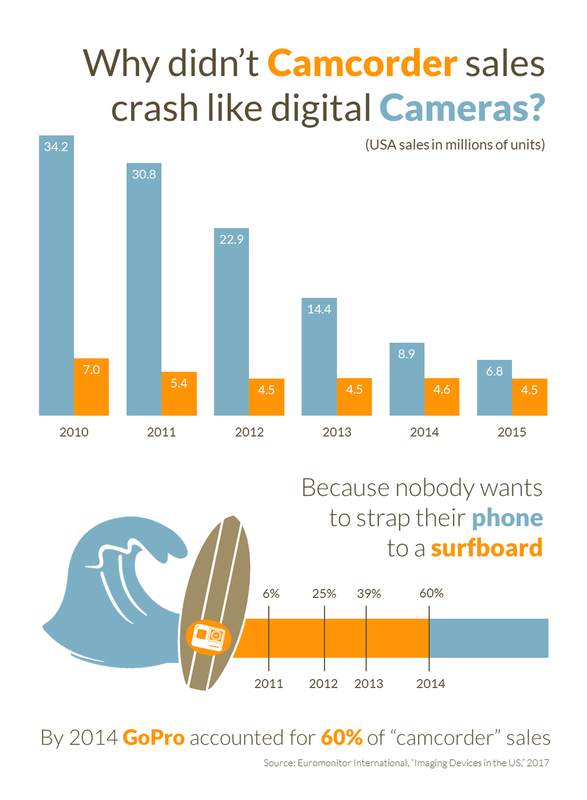 This chart was designed in Canva. Visit www.AskAWalker.com for the latest real estate sales trends in the Northern Virginia area. 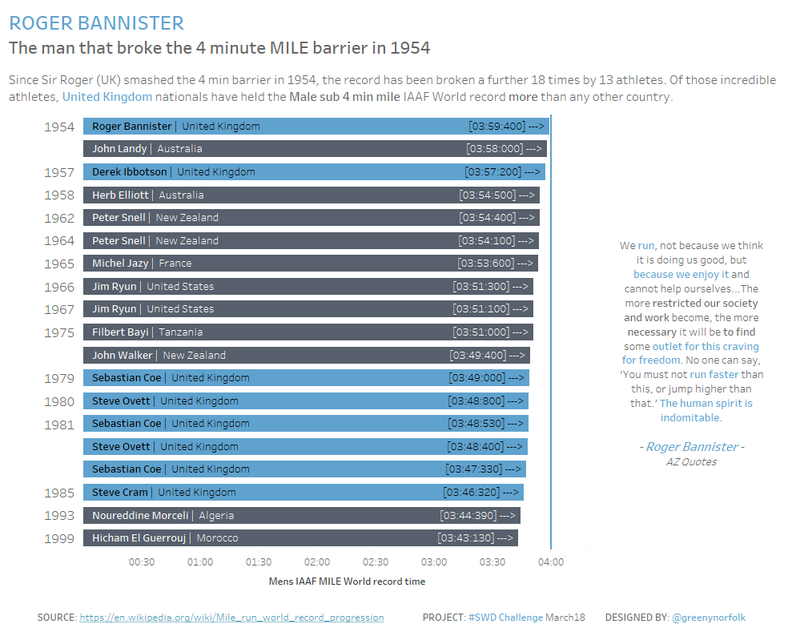 March's challenge centered on the humble bar chart, the data subject, a homage to the recent passing of Sir Roger Bannister (3rd March 2018), the first man to go under 4 minutes to run a MILE. This viz focuses on the world record holders below this magic 4 minute barrier, set in 1954. For this month's challenge I was rather shocked to hear that there were as many as 8 Fast and the Furious films. If I'm being honest I think they should have stopped at 2 maybe 3 but 8 (with plans for more) seems excessive. I've made a pretty simple bar chart showing Adjusted gross revenue in chronological order of film release date. I've used colour to highlight those films that have exceeded the revenue of the original film and have used a reference line to help with the encoding. As I said nothing very fancy but I did download a similar font to the one used on the film posters and chosen the colour of the original car in the film. I did consider sorting by descending revenue but thought the film order possibly helped with the story as people would ask what order they were released. I enjoy watching football but not that much if my team is struggling so bad. It is fascinating to me how bar charts are so simple and yet convey so much information when it comes to population size comparisons. I know goals scored are not the only determining factor for ranking in sports, especially in a football league as competitive as the English Premier League. But a team has go to outscore their strongest competitors at the minimum if they want to stand a chance. In BYU’s management communication program we teach students to write, design, and speak. We emphasize the techniques of storytelling with data when it comes to visualizations. This visualization, built primarily in Microsoft PowerPoint, explains a pattern I discovered in some market research while preparing a presentation on disruptive innovations. I have created a simple bar chart depicting the fastest growing private industries and the revenue made by them. Tool used by me is Tableau. For this challenge I decided to visualise the fatal effect of the recent “Beast from the East” cold wave in different European countries, focusing on Poland and the UK where almost half of its victims were based. You can view an interactive version on Tableau Public and reach out to me on Twitter for comments or feedback. This infographic chronicles the history of college football games between the University of Miami and Florida State University. Three interrelated bar charts tell the story of this rivalry. I built the visual in Tableau, and the interactive version is on Tableau Public. For this month's entry, I have produced the following bar chart from CDC data. This was made with Power BI, and underlines how physical activity and the proportion of students classified as overweight are going in opposite directions for grades 9 to 12 students over the period covered. Although we cannot speak of (negative) correlation, I find that the bars make it easy to underline the trends for the dataset used. 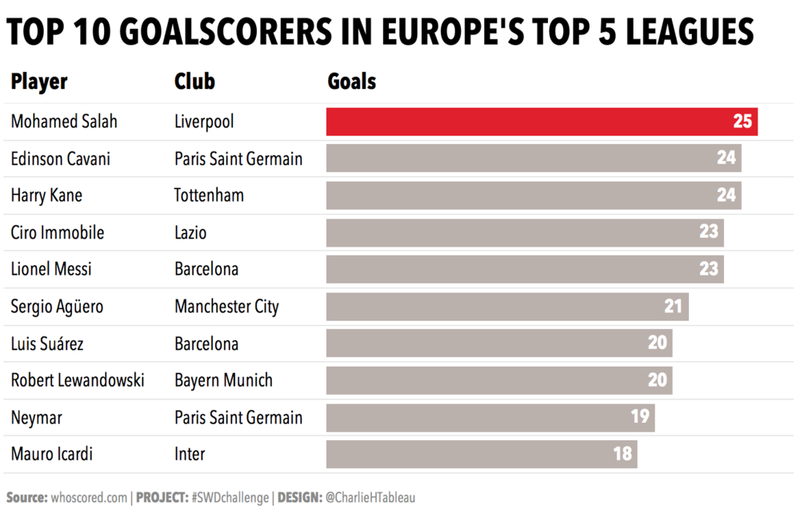 I was watching some Premier League football in the UK here, saw a guy score and knew he was one of the top scorers in Europe and decided to research and chart it. The colour is a reference to Salah’s team (whose team wear red), with all other teams pushed into the background with grey. Here's a pilot viz for part of a collaborative project with my wife Ann, who is a keen small garden blogger. Her blog ‘Green City Gardens’ focuses on gardening in an urban setting, and particularly the role domestic gardeners can play in collectively improving the urban environment both for themselves and the wildlife with which we share our planet. We recorded how many birds visited our garden over a 10-day period in February 2018 including which species. The data visualisation aims to add insight to the title, use colour effectively as well as practice in bar labeling for a less cluttered look. I also practised the storyboard approach, which will inform the final version of the viz for the blog post. The Interactive version is available on Tableau Public. 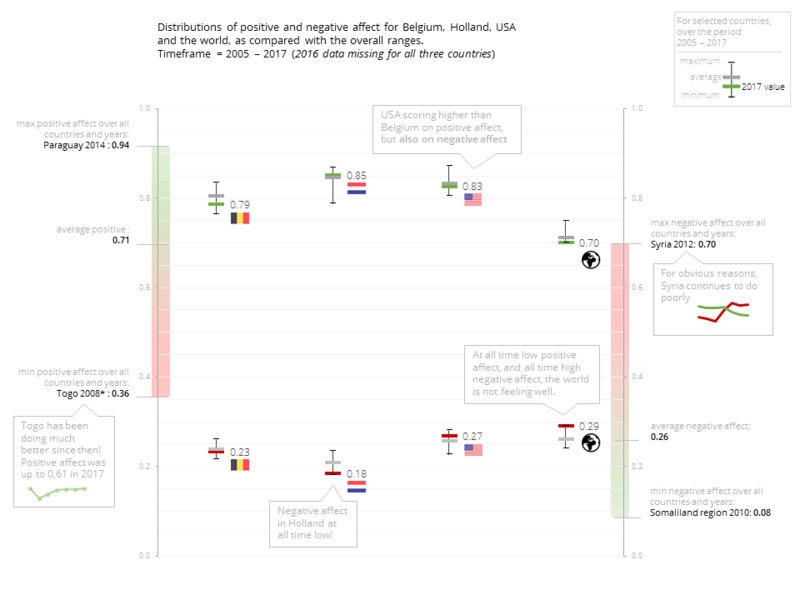 My analysis is the positive and negative effect data for three countries of personal interest (Belgium, Holland, and USA). All data from recently published world happiness report. I used Tableau Public to create the top ten FC Barcelona goal scorers. With the Academy Awards and Times Up this past weekend, I was thinking about women in film, and wondering what data was out there. 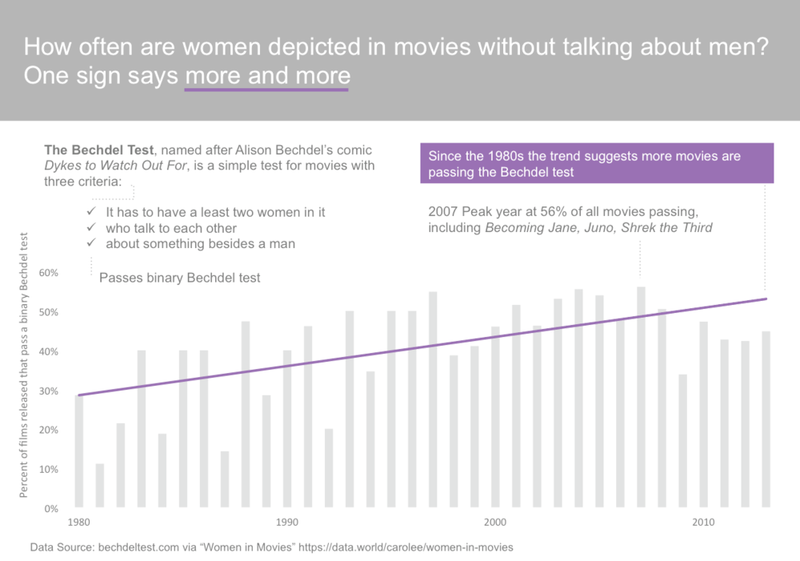 Luckily I found on data.world this great set on Bechdel test, which really asks "Is a female character a character in her own right, or just an extension of a male character?" Back in 2007, more folks lived in cities than in the countryside, so I tried to tell that story with some diverging bar charts. Made with Tableau, data from the World Bank. Tableau public link. For my basic bars I decided to look at Olympic medal count, using colour to highlight gymnasts and swimmers, who dominate the list. 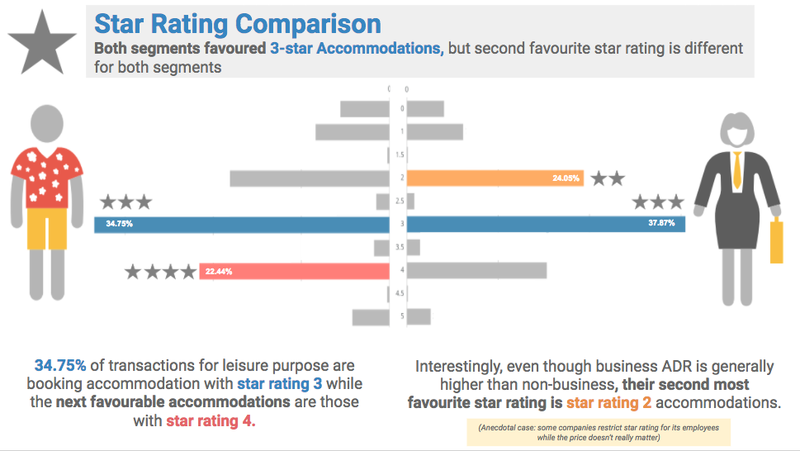 I created this in Tableau and used the viz in tooltips functionality to add an additional level of detail. This is my second version of visualizing my annual tax summary showing how my tax and national insurance contribution payments were spent in the public sector. Here I see that 75% of my Tax % NICs were spent in the top 5 public sector areas: welfare; health, state pensions, education and UK's national debt interest. 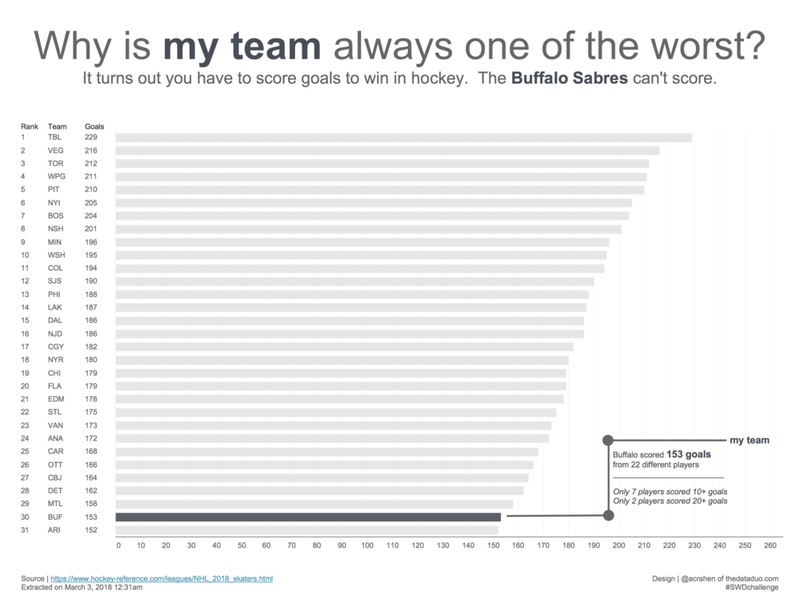 Read more about how I was inspired to create this visualization in Tableau in my recent blog post. I thought I would share my latest viz that I have done for the UK health TUG around diversity as I really enjoyed creating a slightly different type of bar chart (diverging). This viz looks at some of our health care data comparing population figures to those seen by our local District Nursing teams in one of our boroughs in the UK. The district nurses provide an essential home based service to patients that aren’t able to leave their homes to attend clinics. The district nurses are amazing, and will go out in all weathers to ensure they see their patients! Last year I read the fascinating book Stalin's Daughter: The Extraordinary and Tumultuous Life of Svetlana Alliluyeva by Rosemary Sullivan. After Stalin's death, his daughter defected to the US. It got me wondering about other Soviet defectors during the cold war. Being a huge fan of ballet, I felt like most of the defectors I had heard of were ballet dancers. I was curious about the breakdown by profession. This chart is more exploratory in nature and was made with Tableau. This isn’t “simple” but I couldn’t resist. I built this a few years ago in Excel 2010 for a project and the concept has proven useful. I updated the dates so the “today” vertical line shows up. Briefly, this displays the server environments and what happens in each of them during an ERP upgrade. Some environments were used for multiple phases (e.g. TMV 1 and TMV 3). We didn’t have enough hardware to keep all environments available all the time so we had to take them up and down and schedule the teams’ work accordingly. I pulled in causes for mortality, from 1999 thru 2015, on data.gov. I used Tableau to create this bar chart with a purpose to bring forth the comparison between the various causes of death and a hope that it educates people and helps align resources in fighting the most critical causes. Here's a historical look at federal surplus and deficit trends over time. Tried to make it as simple and self-explanatory as possible. Here is my submission for the #SWDchallenge in March. The timing couldn’t have been better since I was already inspired by the Winter Olympics and I was analyzing historical medal count data. I thought I would focus on some outlier nations that are extremely specialized in only one sport. The stacked bar chart is based on volume (medals in specialized sport and medals in other sports). Percentage is also a key factor in the story, but I chose not to visualize that information because by definition, these are the only nations with at least 90% of their medals in one sport. Visualizing percentage could be useful information, but the trade-off might be that I have too much information. These 5 nations are anomalies in terms of their extreme allocation of medals in only one sport. Hopefully, I have done these unique and talented nations justice by visualizing just how specialized they are. You can find me on twitter at @jaydpauley and on Medium. As the deadline for this challenge is midnight just before the beginning of International Women’s Day, I wanted to take a look at some gender-related data. I turned to the just-launched Open Think Tank Directory for a dataset on think tanks. The chart shows the share of think tanks in each region that are led by women, men and, in a few small cases, when they’re led by more than one person with a mix of genders. At one level, it makes sense to give the breakdown as a percentage of the total — but I also wanted to give a bit of context to these numbers, as our dataset is substantial but not complete. The chart on the right shows the number of think tanks included in each region and how many we have information about the gender of their leader. Who ever said you can’t visualize missing data? 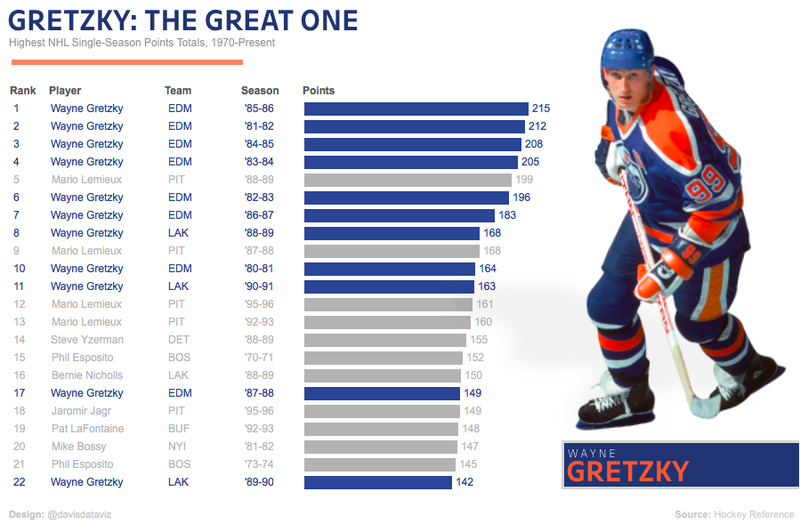 As a huge sports fan from Minnesota, I've been wanting to tackle this viz for quite some time to see just how bad our men's professional sports teams have been. My goal was to look at the four major professional sports in the U.S. and for each sport, sort the teams from most to least number of seasons played without a championship. I was certain the Minnesota teams would be near the top in all sports and had a hunch Washington D.C. teams would be up there too. However, I didn't realize just how close their droughts would be in total. I used color to call out just the teams belonging to these two fan bases and included maps that can be hovered on for more detail. To pick a topical subject, we’ve looked at steel in the United States. US President Donald Trump is justifying the proposed 25% and 10% tariffs on US steel and aluminium imports on national security grounds, avoiding World Trade Organisation scrutiny as the multilateral trade body does not have the powers to rule against measures imposed on ‘national security’ grounds. However, our graphic shows that the steel and aluminium sectors are not as nationally important as Trump believes. We’ve tackled this as a bar (well, column) chart looking at the steel industry’s decreasing share of total US GDP and jobs since 1993. As this is a fairly simple time series, we’ve gone for eye-candy to engage the reader, creating the bars from a photo of a steelworks. We’ve shown the workforce share as a line on a second Y axis; we tend to tackle this by making sure the line, Y axis labels and legend use the same colour, with legends for left and right axes to the appropriate sides of the charts. The chart was first constructed in Excel, and then taken into Illustrator so we could do most of the finessing. 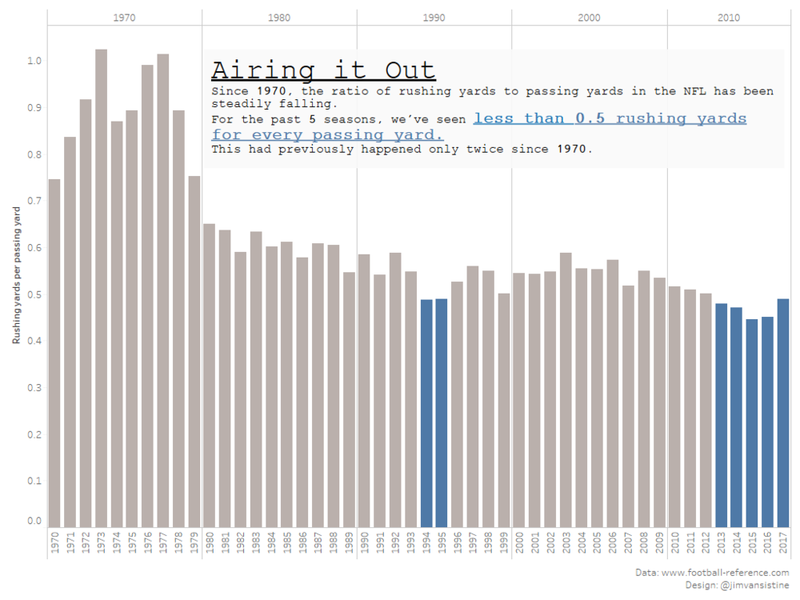 For this month's challenge, I looked at the ratio of rushing to passing yards in the NFL since 1970. Even with the trend falling steadily, the last 5 seasons have been historically low, built using Tableau. Workbook and data can be found here. I love this data set because it makes big numbers easier to think about. As always, I started by discovering the story: figuring out who my audience is (the heroes), the big takeaway (the theme), how all the evidence supported the takeaway (the plot), and how the audience would consume the information (the setting). Then I worked on the narrative that would tell the story: how do I place my audience, as heroes, into the data story? How do I make the analysis relevant to them and invite them to learn? What visualization best illustrates the plot (spoiler alert: bar chart!)? And, of course, how do I flesh out the plot with the things that make the story worth experiencing: color, annotations, and other design elements. Once I had a general wireframe drawn, I built the visualization in Tableau. The bars may be basic but this chart went through a few iterations as my story kept changing! Data viz created using Adobe Illustrator. I used Tableau public to show the 3 hardest holes at the 2017 Masters golf tournament. I defined the hardest as the holes that had the highest percent of scores over par. I sorted the data by hole number instead of by the highest percent because as a golfer it seemed more logical to me to see them in order of the holes. For March's #SWDChallenge, I have explored my 16 months of daily walking data collected from Moves App. The bar graphs visualize average and median number of steps I have taken for each day of the week. It is clearly highlighted that my weekends are comparatively more active than weekdays. Also since I am not much into outdoor activities, there are not many outliers in the data, because the average and the median are fairly close to each other. I ended up using my personal data for the chart, very simple. When Roger Deakins won an Oscar last night for Best Cinematography, the announcer mentioned that that was his first win after 14 nominations. 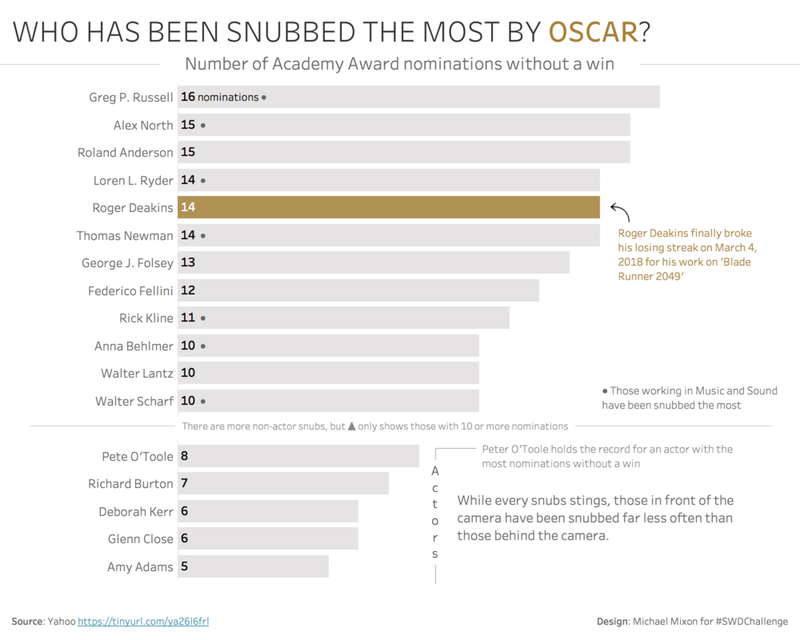 So I got curious about who else has been nominated a lot w/o ever winning. While Women’s Day is all about celebrating women’s achievements, it is also important to reflect on what holds them back. 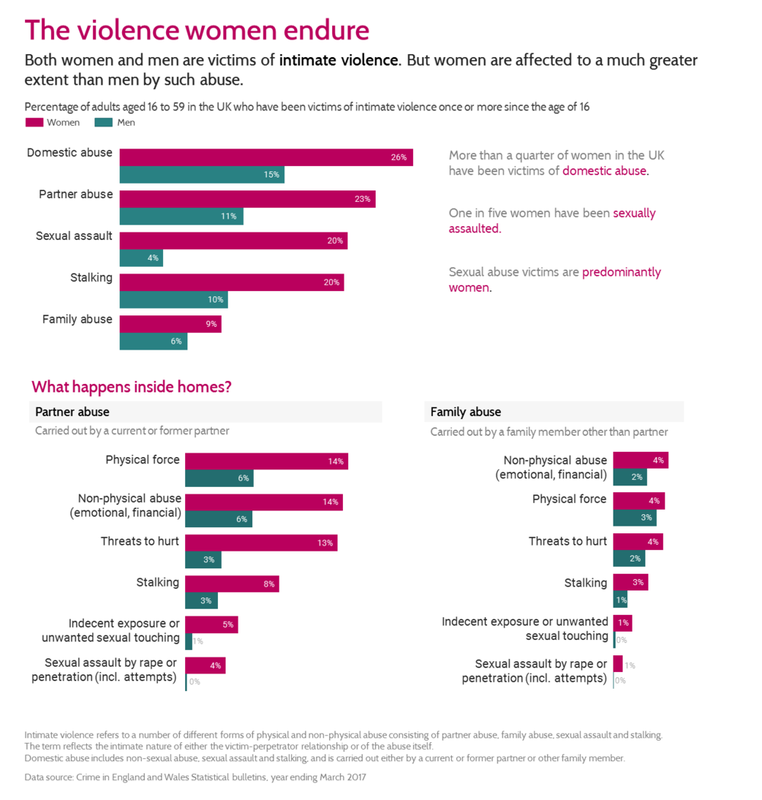 Gender violence and domestic abuse predominantly affects women. I look at some stats on it from the UK. More in the post here. I scraped beer data from beeradvocate.com, filtered on U.S. breweries, aggregated by style, and calculated the percent of beers that fell into each style. To my delight IPAs and double IPAs came out in the top two spots. I used R to make the chart. I wanted to find some data that was interesting that could show how using some color would revel changes. I was surprised at Iran's data so when I saw that outlier along with Morocco's so I thought it would something that other people would pick up on easier like I did with the color. My “readers” are often internal stakeholders so when I annotate charts to call attention to specific data I often take that opportunity to pose questions to them. I find this helps guide discussions and keeps them more interested in reading (and responding to) what I give them. 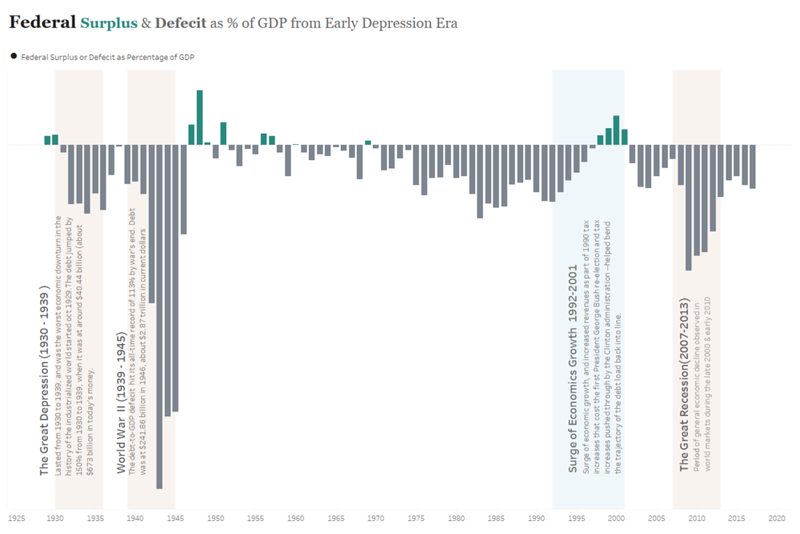 I made this chart in Excel, sorted my data in descending order for more clarity, formatted the x axis to 100% (it defaulted to 70%), and added two text boxes, one for the title and one for the annotation. In the 2016 Alabama Senate special election, Doug Jones flipped 12 countries won by Donald Trump in the 2016 Presidential election from red to blue. Bars were not my instinct when I first looked at this data. However, this seemed the perfect opportunity to challenge myself to keep my chart choices simple. For me, the story is in the drastic change over a relatively short period of time. For that reason, I focused on the counties that flipped from Republican to Democrat. I reviewed the data on Super Bowl Coin Flips to see how often the winner of the coin flip goes on to win the game. While I created a simple bar chart using Tableau, I didn't use the bars to aggregate the data, as is the typical use case for a bar chart. I looked at doing it that way first, but it only resulted in two bars—one for heads and one for tails, which wasn't too exciting or interesting. Instead, I used the bars as a binary indicator, either heads or tails for each Super Bowl, and then color coded the bar to indicate whether the Coin Toss Winner won or lost the game. So I ended up putting a twist on the regular old bar chart but still kept it simple. KDnuggets conducts yearly polls on what tools data scientists use and this is how the tools rank. I am glad you were curious about the previous year results because when I looked for that data I decided to use 2016 poll numbers which seemed to be different from the summary columns in the 2017 table indicated. Lesson learned—always check your data! This month I created a grouped bar chart showing the time we spend looking at and communicating with our media devices. The data comes from a population sample in The Netherlands, collected in 2015. I like incorporating legend information in subtitles, and this chart was a good candidate for that. 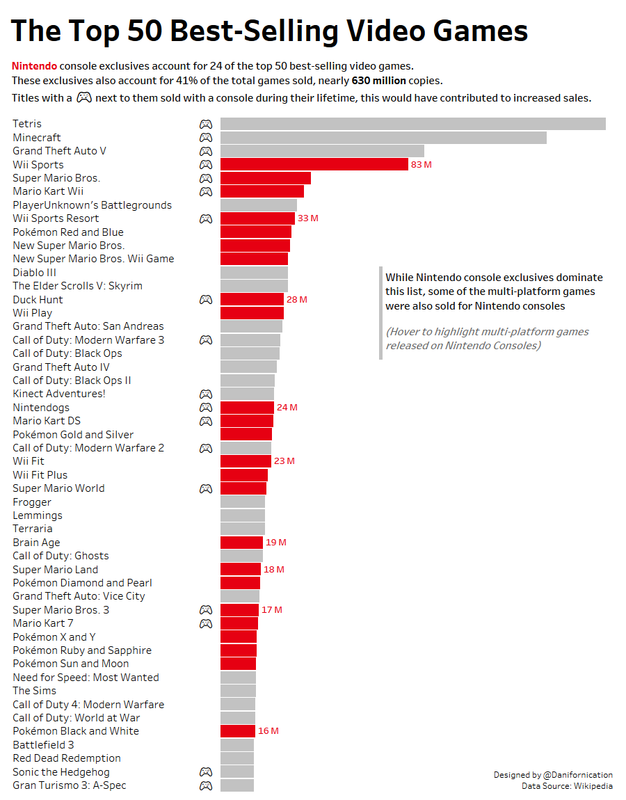 This chart was created in d3.js. Given that the brief was to use a simple bar chart, I opted for a simple dataset. I recently read an article by Forbes which listed the top 5 wealthiest hip-hop artists and their overall net worth. I thought this would be ideal for the challenge as it’s not a subject-matter that’s commonly visualized. I included the net worth of each artist listed for both 2018 and 2017, opting to use bar-in-bar charts to show the growth in net worth over the last 12 months. Interestingly, this is the first year in the history of the annual list that Diddy hasn’t placed first. I included some text to the right of my visualization to help explain how each artist had made their millions too. Ironically none of the artists listed have become super rich from their music alone. They have all branched out into other areas such as alcoholic beverages, music streaming services or clothing. I wanted to draw attention to Jay-Z since he topped the list so I included his bar and the headers of any associated text relating to him in red to make it stand out, keeping everything else in black and grey. You can interact with my visualization on Tableau Public. For March Basic bar chart challenge, I looked at what the top 25 profitable companies made in 2016. From the chart, we can see Apple leads the game with $45.7B net income making $1,444 per second in 2016. That’s 1,0 17,219 times the *median earnings of an American worker per second. I’m a semi-professional appreciator of music and when you pair that with my knack for data analysis and visualization, you end up scraping every single Billboard Hot 100 chart going back to 1958 to look for trends. Well, in my initial exploration, I was curious what the distribution was for amount of weeks spent on the chart. So I built a histogram depicting just that. And the result intrigued me! The MAJORITY of songs to ever chart on the Hot 100 have spent exactly 20 weeks. As a data analyst, I knew this was the point of entry into further analysis. By breaking it down further by number songs each year to spend exactly 20 weeks on the chart, I again saw a massive jump in 1991. This led me to do some research and come to find out there is a little known rule in the Hot 100 criteria. “Any song to spend 20 weeks on the chart AND not rise above the 50th spot will be designated as “recurrent” and removed from the list.” Billboard implemented this rule as a way to keep having fresh new songs added to the list. Inspired by my recent attendance at the storytelling with data workshop in London, I decided to set up a Tableau Public profile and give the next challenge a go. My visualization shows day by day breakdown of cycle hires in London but I wanted to focus on the reasons for some of the larger entries using colour to do so. Here is my very simple attempt to use bar graphs for showing the tallest 25 buildings in the NYC with their purpose and building material used. I have kept it as simple as possible focusing on bars as a medium to show the height. I have purposely not sorted the bars so as to give it a look of a skyline. At our beginning of the year professional development day for staff, our superintendent wanted to communicate the gains we have made over the last decade in UC/CSU “A-G” completion rate (it’s a measure in California of how many high school graduates complete a set of classes from different curricular areas). We used to have a table of values for each year, with yellow highlights for our schools. I wanted to create something more visually striking, illustrating that our schools have moved from down here, to up there. 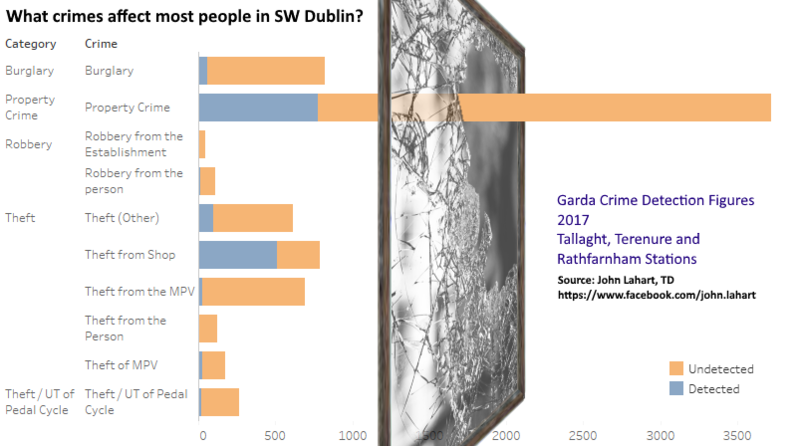 The chart depicts the detected and undetected crimes in South West Dublin as reported by the Gardaí (Irish police). The graphic is used for emphasis. I've picked the topic of Super Bowl 51 and using a column chart have depicted how the New England Patriots overcame a huge deficit to stun the Atlanta Falcons in overtime. This is a column chart with zero gap width between each data point, hence at first glance it provides an illusion of an area chart. The chart tells the story of how Atlanta held a lead for the major portion of the first 3 quarters only to slowly lose out in the 4th quarter, eventually losing in overtime 34-28. Multiple charts on climate change and you can see the remainder of them on Twitter. My goal was to show that in a first past the post election (like the one in the United Kingdom), the percentage of votes a party receives does not reflect on the number the seats a party wins. The bars were colored according to the traditional color scheme for the political parties. In light of International Women's Day on March 8th, I decided to pick a topic close to me - the proportion of female engineering students in Canada. As an industrial engineering graduate myself, with several female relatives graduating in the 80's and 90's, we always spoke about the low representation of women in this field, and how ratios haven't seemed to change over time. I wanted to explore the proportions across the various disciplines, and if/where there has been any improvement. I have taken the statistics of the top 20 happy countries. I wanted to check what all contribute to the overall happiness of a country. One important observation - not all countries on the list are generous. 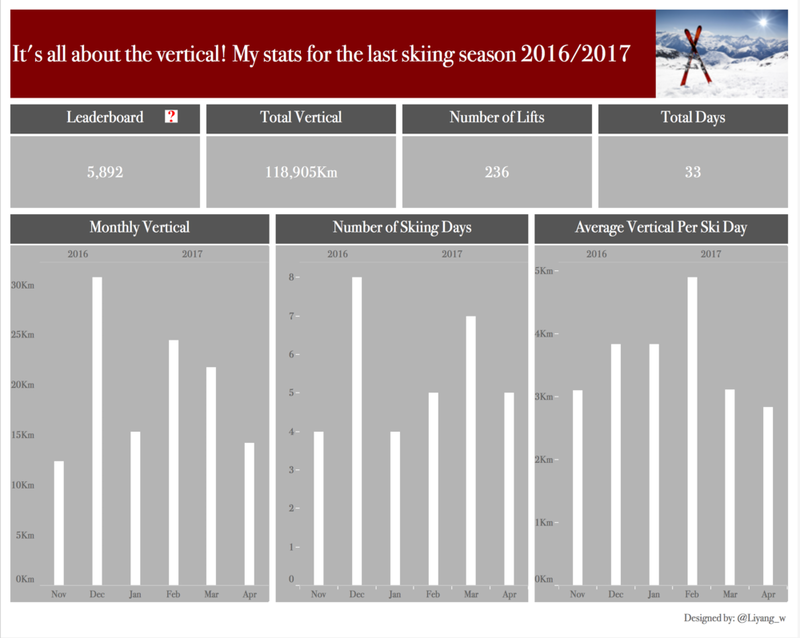 This is my very first submission for the SWDchallenge, created with Tableau. It shows the cost assessment of antibiotics used to treat bacterial infection, and the rate of resistance against the selected antibiotics, sampled globally between 2012 to 2017. Thanks again to everyone who took the time to create and share their work! Stay tuned for the next #SWDchallenge, which will run the first week in April.